When Brownie Elberfeld the American league's stormy petrel, draws the envelope that contains the last installment of the monthly $650 that he receives for doing star stunts about the short field, the places that knew him during the baseball season know him no more. The first train carries the Kid with his wife and little family to the player's winter home on Lookout mountain, many miles from a post office or telegraph station in the heart of the wilds. Here on his little farm the Kid spends the winter, caring for his stock, adding to the buildings which make his place one of the most pretentious in the neighborhood, and keeping strong and healthy in the life out of doors. Just at present. however. the player Is at outs with several of his neighbors, and the coming winter is likely to. see the ball player embroiled in a real southern feud. It is all over a calf—a nice little Jersey—and in the row the characteristics of the player on the diamond have come as prominently to the fore as they have ever been shown during the games that Detroit played with Chicago while. Sheridan umpired. As the Kid tells the story, the herds of cattle owned by the Mountaineers range wild through the greater part of the year ands are differentiated solely by the brands on the occasions of the round ups. The little Jersey hnd been purchased by the ball player at the cost of $25 and had been duly branded with the ball player's initials. As it grew up on the range the calf's brand became less distinct, and one day the ball player was surprised by a visit from a neighbor. "That's mah calf," said the visitor. "How-all did she get here?" "To the tall timbers with you." responded the ball player; "she carries my brand right now." "You're a thief and a liah," responded the mountaineer, and then they clinched, the ball player showing the native what happened to Umpire Cantillon at Bennett park one eventful day. Since the beginning of the ball season the calf has been steadily failing in health. Elberfeld had a couple of cracker friends who swear by him. Of course it isn't poison. 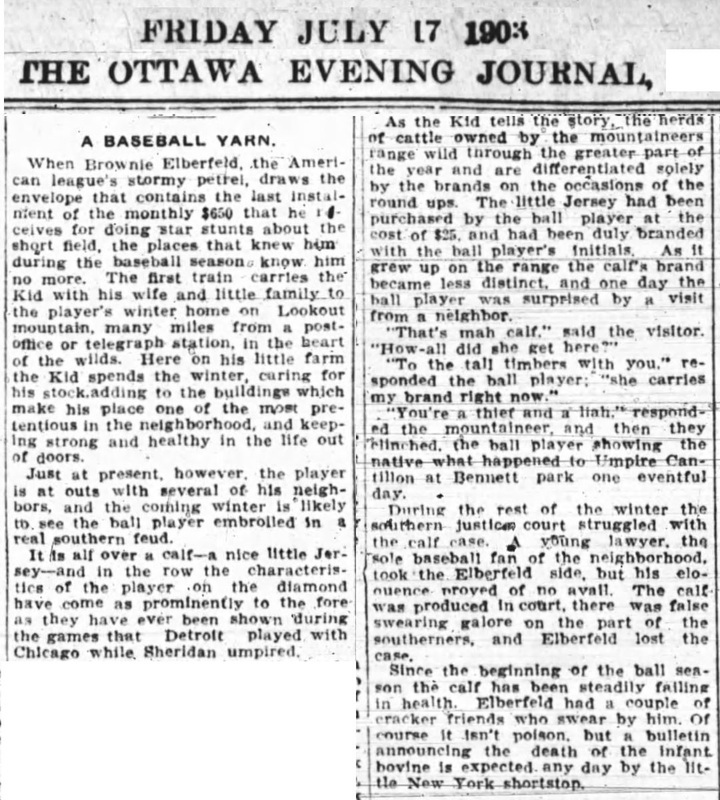 but a bulletin announcing the death of the infant bovine is expected any day by the little New York shortstop.